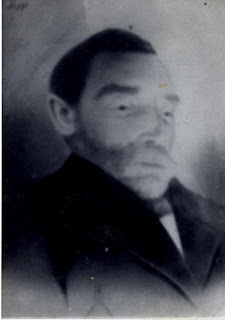 This is a photo of George Washington Sapp taken postmortem. On the back of the photo it is written that he died at the age of 54 which I truly believe is incorrect. There are a couple of discrepancies around his birth whether it was 1834 or 1844, and these discrepancies are in the 1900 and 1910 census. The first stating DOB as 1834 and the latter stating it as 1844; either way he was still alive in 1910 according to the 1910 census and believed to not have passed away until 1914. The record that I presently have attached to him as a record of his death, I am not 100% sure about. It says that he died in Jackson, Florida and if that is the case I don't know why he was there. So there is some more research that needs to go into George, but something I can't do until I am in the Jenkins County area. In the 1910 Census it shows that George was a widow, therefore his wife Mary Perkins had to pass between the 1900 and 1910 census. However there were three granddaughters living in the house with him and two of his sons. At this time George was either 66 or 76 years old. The three granddaughters that were in the household with him were the daughters of his son George, Jr., there names were Leila, Beulah, and Eular. George Washington Sapp, Jr. was also the son that moved to Florida, so it is very possible that George, Sr. died and was buried there. There are other unknowns when it comes to George Washington Sapp. Was he Caucasian or Mulatto? Well the census states that he was mulatto, but that could because his wife was mulatto and his children were of obvious mix breed. I was told that George was Caucasian and chose to marry this mulatto women. He was a landowner as far back as 1900 and possibly even before that, when those around him were listed as renters.This was not often the case for mulatto or black farmer in 1900 Georgia. All of his children were also landowners, and this was told to me by my grandmother Irene, and proven by the various census records. In the 1880 census George and Mary were of course married with a family of their own, but they lived right next door to the Perkins family. Now Mary Perkins is listed as mulatto in the census, and that she was, but the Perkins next door are all listed as black. What is even more interesting is that there is no man in the Perkins household, there is Millie age 60, with several younger children and another older woman Elmirah,age 62. Again there is no adult male. Now I am inclined to believe that Millie is actually Mary's mother, because of the tradition of family names, Mary had a daughter named Minnie and the other named Lillie. Now Mary is 35 years old in this Census and Millie is 60, which leads me to believe, because of her looks and listing as mulatto, and Millie would have been about 25 years old when Mary was born, that Mary is probably the Massa's child, or a white male in the owners household. The other children in the household would also be Mary's siblings.